This week I've been researching and writing 2 speeches and a separate article for a business magazine. I visited the London Library in St. James Square SW1 and I'm considering becoming a member - it truly is a brilliant and inspiring library. I've always found that if something is troubling me and I write it down I can bring order to the situation and I am able to look at the it more rationally. The power of words....... My blog this week is about the power of words. I was invited by Lord Saatchi to his Friends and Family opening night of his late wife Josephine Hart's Poetry Week at the Arts Theatre. Over five nights the work of some of the world's greatest poets were celebrated and brought alive with the help of Josephine's words and the poems themselves, read aloud by some of the finest actors. This first night were poems by TS Eliot read by Edward Fox and Harriet Walter. The evening was a real treat. There was a fantastic audience of family and friends too from Edna O'Brien, Bob Geldorf, Sir Simon Jenkins, Sabrina Guinness, Lord Gowrie, etc etc. I have The Josephine Hart Poetry App on my iPad which I highly recommend too. However there is nothing quite like seeing poetry performed at this level. Last Wednesday (October 10th) was World Mental Health Day and I was invited to the charity performance of the play 'Bully Boy' at the St James Theatre in collaboration with Combat Stress. There was a lively Q&A session afterwards with the play's writer Sandi Toksvig, the cast - Anthony Andrews and Joshua Miles, director Patrick Sandford and Commodore Andrew Cameron who is the Chief Executive of Combat Stress. The play is about a young squaddie in Iraq who is court-marshalled for his role in the death of an 8 year old Arab boy, it's a question of class and rank when his defending officer is a Falklands War veteran. 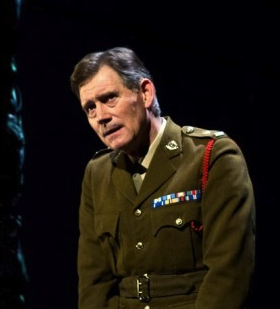 Anthony Andrews is brilliant as the war veteran and Joshua Miles as the young squaddie - his first play - is just excellent. I have never seen a play with a continuous standing ovation before - it is seriously a must see. The energy, the stress the emotion all powerfully portrayed. The Q&A were good too and then we had drinks with everyone afterwards downstairs in the studio bar. The play highlights a very neglected area of PTSD (post traumatic stress disorder) soldiers returning from war with little help for them to integrate back into society. So as Sandi said its either The Priory or prison. The soldiers need our support and understanding - that's where Combat Stress comes in but they have had cuts implemented............Sandi's script is very powerful. My guest was Hugh Lillingston, a Master Practitioner and Trainer of NLP and Hypnosis and a teacher of Huna who is one of the practitioners of the warrior programme a charity which has helped many ex-soldiers get their lives back on track. I met Hugh and his wife Catherine through Tracy Worcester. My next event was a dinner with the entrepreneur, Luke Johnson (Risk Capital Partners) at CSFI (Centre for Study of Financial Innovation) - a financial think-tank in London and New York. I've been asked to produce a TV Channel for Entrepreneurs - so it seems in the same week appropriate that I go to a dinner with one of the UK's most high profile entrepreneurs. Luke was great despite us exhausting him with questions - he answered all of them - no complaints - mind you the food was delicious so I think that may have helped sustain us all. "Poetry is thoughts that breathe and words that burn" - Thomas Gray.